00:34 SHALOM, HELLO AGAIN. WE'RE CONTINUING FROM LAST WEEK. 00:38 I THINK, A VERY INTERESTING AND EDUCATIONAL SORT OF PROGRAM. 00:48 WHICH HAS TURNED OUT TO BE THE DE FACTO PALESTINIAN CAPITAL, IF YOU WILL. 01:02 THEY TOOK US TO DR. HANAN ASHRAWI, WHO IS ONE OF THE PALESTINIAN AUTHORITY SPOKESPEOPLE. 01:08 SHE HAS RECENTLY APPEARED IN THE UNITED STATES AT UNIVERSITY OF COLORADO, I BELIEVE. 01:13 SHE HAS, BEFORE, BEEN A SPEAKER HERE. 01:15 SHE TAUGHT AT THE UNIVERSITY OF VIRGINIA. 01:18 SHE GAVE US HER VIEW OF THE WHOLE CONTROVERSY GOING ON IN ISRAEL. 01:25 I LISTENED POLITELY. I DID NOT INTERRUPT OR ARGUE. 01:29 MUCH OF WHAT SHE SAID IS WORTH HEARING AND QUITE TRUTHFUL. 01:36 OTHER THINGS ARE MORE CONTROVERSIAL. 01:41 WE TURNED THIS FOOTAGE OVER TO 2 ARAB-CHRISTIAN EXPERTS THAT WE KNOW. 01:46 DR. ASHRAWI IS AN ARAB-CHRISTIAN AND HER PEER, DR. ERGUN CANER, IS AN ARAB-CHRISTIAN. 01:51 HE'S A PROFESSOR AT CRISWELL COLLEGE IN DALLAS. 01:57 A VERY KNOWLEDGEABLE ARAB-AMERICAN CHRISTIAN. 02:01 DR. CANER WAS RAISED AS THE SON OF A MUEZZIN, AS A MUSLIM. HE THEN CONVERTED TO CHRIST. 02:09 JOSEPH FARAH WAS RAISED IN AN ARAB-CHRISTIAN FAMILY. 02:17 AND THEY COMMENTED ON WHAT SHE SAID. 02:24 WE'LL HEAR FROM DR.ASHRAWI AND THEN OUR COMMENTATORS. 02:29 I READ AN ARTICLE ABOUT YOU IN AN ANGLICAN MAGAZINE DESCRIBING YOUR CHRISTIAN TESTIMONY. 02:33 IT WAS EXCELLENT.ON THE MCNEIL/LEHRER REPORT YOU MADE A STATEMENT THAT WAS CURIOUS. 02:38 YOU SAID JESUS CHRIST WAS A PALESTINIAN PROPHET, BORN IN BETHLEHEM, IN MY COUNTRY. 02:43 I WONDERED ABOUT THAT. 02:48 BUT HE WAS A PALESTINIAN BECAUSE HE WAS BORN IN PALESTINE. 02:54 BUT THOSE WHO CHOSE TO BE ISRAELI ARE ISRAELI JEWS. 02:59 THERE ARE MANY MOSTLY OUTSIDE OF ISRAEL WHO ARE PALESTINIAN-CHRISTIANS. 03:02 THERE ARE SOME WHO ARE PLURALISTIC. 03:05 I FELT THAT HE BELONGS TO MY HERITAGE, TO MY PAST. 03:08 WE ARE THE MOST ANCIENT CHRISTIAN COMMUNITY. 03:12 HE WAS A PALESTINIAN, HE WAS A JEW AND HE BECAME A CHRISTIAN. 03:17 WE HAVE TO DEAL WITH THE ISSUE OF HANAN ASHRAWI'S CHRISTIAN TESTIMONY A LITTLE BIT. 03:36 RATHER THAN A DEEP-SEEDED BELIEF OF THE HEART. 03:41 I BELIEVE THAT'S WHERE HANAN ASHRAWI IS COMING FROM IN DEFINING HERSELF AS A CHRISTIAN-ARAB. 03:48 SHE TALKS ABOUT JESUS CHRIST BEING A PALESTINIAN. 03:53 HER RATIONALE FOR THAT IS THAT HE WAS BORN IN PALESTINE. 03:56 WELL, THAT'S KIND OF LUDICROUS BECAUSE THE FIRST TIME THE TERM PALESTINE IS USED IS IN 70 A.D.
04:11 AFTER THEY DESTROYED THE TEMPLE AND COMMITTED GENOCIDE AGAINST THE JEWS. 04:16 THE IDEA THAT JESUS CHRIST WAS A PALESTINIAN IS VERY MUCH OF A STRETCH. 04:36 THEY BEGIN TO ACT LIKE A MUSLIM GOVERNMENT? 04:40 THEY TELL YOU TO COVER YOUR HAIR AND THIS SORT OF THING? 04:47 LIBERAL AND PLURALISTIC SOCIETIES IN THE ARAB WORLD, IN THE REGION. 04:52 TOLERANT! OPEN! I WONDER HOW SHE WOULD CLASSIFY THE 6 DAY WAR. WAS THAT TOLERANT AND OPEN? 05:02 HOW ABOUT YOM KIPPUR? 05:07 THAT WE SHOULD NOT BOMB DURING RAMADAN, THAT WE SHOULD NOT BOMB DURING ID AL-FITR. 05:12 WE SHOULD NOT BOMB DURING THE HOLY DAYS OF MUSLIMS BECAUSE THIS WOULD OFFEND THEM WORLDWIDE. 05:19 THE DAY OF ATONEMENT, FOR THEM TO BOMB ISRAEL? 05:30 PLURALISTIC AND TOLERANT SOCIETIES IN THE REGION. 05:33 WELL I DON'T KNOW WHAT TIME FRAME HANAN ASHRAWI IS TALKING ABOUT. 05:37 FIRST OF ALL THERE HAS NEVER BEEN A PALESTINIAN STATE. 05:44 KNOWN AS PALESTINE IN THE HISTORY OF THE WORLD. 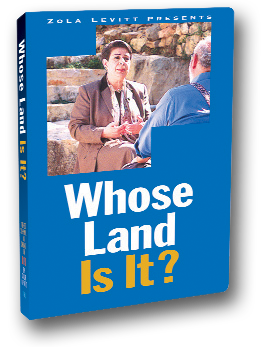 05:48 SO YOU FIRST OF ALL HAVE TO ASK YOURSELF WHAT PALESTINE IS HANAN ASHRAWI TALKING ABOUT WHEN SHE DEFINES IT THAT WAY? 05:59 AS THE STANDARD FOR THE MIDDLE EAST, THERE IS ONLY ONE. IT'S THE STATE OF ISRAEL. 06:16 AND ISRAEL IS THE ONLY LITTLE TINY BASTION OF DEMOCRACY AND FREEDOM IN THE REGION. 06:23 ISLAM HAS ALWAYS BEEN THE MOST INCLUSIVE RELIGION BECAUSE IT DIDN'T COME TO DENY PREVIOUS RELIGIONS. 06:28 IT CAME TO AFFIRM THE TWO PREVIOUS RELIGIONS. 06:47 AND TO USE THEM TO PUNISH, TO POUND, TO BASH THE OTHER AND TO NEGATE AND TO DENY THE OTHER. 06:53 THAT IS THEIR PROBLEM AND YOU HAVE THOSE ELEMENTS IN ALL 3 RELIGIONS. 07:02 THAN IT IS IN ISLAM, THAN IT IS IN JUDAISM. 07:09 FUNDAMENTALIST CHRISTIANS HAVE NOT ATTACKED ANYONE OR BROKEN DOWN A WORLD TRADE CENTER. 07:15 WELL, IT FINDS MANY DIFFERENT EXPRESSIONS. 07:18 FUNDAMENTAL CHRISTIANS ALSO NEGATE THE VALIDITY AND LEGITIMACY OF THE OTHER, WHICH IS VERY UNCHRISTIAN. 07:32 REGARDLESS OF MY RELIGION AND INSIST ON NEGATING MY VERY RIGHTS, WHICH IS WHAT'S HAPPENING NOW. 07:43 MY LIFE FOR THE SAKE OF THEIR INTERPRETATION OF THE BIBLE. 07:47 THIS, TO ME, IS THE MOST DOGMATIC AND RIGID AND UNCHRISTIAN AND INHUMAN WAY. 07:59 OR BY MULLAH OMAR, THE FIRST GROUP TO WHICH THEY SPEAK IS NOT THE INFIDEL COMMUNITY. 08:06 IT'S NOT THE PEOPLE OF THE GREAT SHATAN. 08:08 IT IS, IN FACT, SPEAKING TO OTHER MUSLIMS. 08:11 WHEN THEY SAY, YOU HAVE BEEN OBLIGED; YOU HAVE BEEN FARDIL, OBLIGED TO HOLY WAR. 08:17 IN OTHER WORDS, THEY DON'T SEE THEMSELVES AS FUNDAMENTALISTS. THEY ARE PURISTS. 08:21 THEY BELIEVE THE KORAN. THEY BELIEVE THE HADITH. 08:24 THEY BELIEVE THAT ONCE YOU HAVE BEEN OBLIGED TO HOLY WAR, YOU MUST FIGHT HOLY WAR. 08:29 THEY ARE NOT FUNDAMENTALISTS. INSTEAD, THEY VIEW THESE MUSLIMS AS BAD MUSLIMS. 08:36 IF A STATE IS ESTABLISHED, DO YOU SUPPOSE HAMAS AND OTHER MILITANT GROUPS WILL STOP THE RESISTANCE? 08:44 OH, YES THEY WILL, OF COURSE. 08:54 AS OPPOSED TO OTHER PAN-ISLAMIC ORGANIZATIONS, IS THAT THESE ARE LINKED TO A CERTAIN NATIONAL STRUGGLE. 09:00 HAMAS AND JIHAD, THEY'RE PART OF A STRUGGLE AGAINST THE OCCUPATION. 09:09 THEY DO NOT HAVE A GLOBAL MESSAGE. THEY ARE NOT OUT THERE. 09:14 THEY'VE NEVER CARRIED OUT ACTIONS OUTSIDE OF PALESTINE. 09:19 OR KILL PEOPLE OR IMPOSE A PAN-ISLAMIC AGENDA. THAT'S ONE. 09:28 IN ORDER TO WEAKEN EXTREMISM BY DEMOCRATIC MEANS. 09:33 THIS IS HOW WE SHOULD DEAL WITH IT. 09:36 THE MAJORITY OF PALESTINIANS ARE COMMITTED TO A 2-STATE SOLUTION. 09:41 THEY'RE COMMITTED TO ACCEPTING THE OTHER. 09:44 THEY'RE COMMITTED TO THIS INCLUSIVE APPROACH. 09:47 THEY DON'T WANT TO DESTROY THE STATE OF ISRAEL OR REPLACE THE STATE OF ISRAEL. 09:53 HANAN ASHRAWI SUGGESTS THAT THE PALESTINIAN PEOPLE SUPPORT A 2-STATE SOLUTION. 10:03 A SEPARATE ISRAELI STATE LIVING SIDE BY SIDE IN PEACE AND HARMONY. 10:14 AND I SEE NO EVIDENCE TO BACK THAT UP. 10:17 I WISH IT WERE SO. I WISH IT WERE SO. 10:26 THE INTERVIEWS I'VE CONDUCTED ON THE GROUND THERE, I SEE NO EVIDENCE TO SUGGEST THAT. 10:31 IT'S WISHFUL THINKING ON HER PART AT BEST. 10:46 I'VE BEEN LISTENING TO ZOLA FOR 5 OR 6 YEARS. 10:49 WHEN MY MOTHER CALLED AND SAID, "I'M PLANNING A TRIP TO ISRAEL. WOULD YOU LIKE TO GO?" 10:53 I DIDN'T HESITATE.I SAID, "ABSOLUTELY." 10:55 SHE SAID,"DO YOU KNOW ANYWHERE OR HOW TO GET THERE?" 10:57 I SAID, "ABSOLUTELY, LET ME GIVE ZOLA A CALL." 10:59 THIS IS THE MOST SPECIAL PLACE IN THE WORLD AND THIS IS THE PLACE WE WANTED TO BE. 11:04 WE CAN'T IMAGINE THAT WE'RE HERE. 11:06 IT'S, YOU KNOW, WE JUST CAN'T IMAGINE WE'RE HERE. 11:15 WELL, OUR TOURS OF THE HOLY LAND CONTINUE AS USUAL. THEY'RE SOME TENSION OVER THERE. 11:20 IT'S NOT AS DANGEROUS AS STAYING HOME AND I'VE SPECIFIED THAT MANY TIMES. 11:33 ONE OF THE SPOKESPERSONS FOR THE PALESTINIAN AUTHORITY. 11:44 DR. ERGUN CANER AND JOSEPH FARAH AND THEY COMMENTED ON WHAT SHE SAID. 11:50 I STEPPED OUT OF IT, I'M THE NEUTRAL OBSERVER. 11:53 I GOT THE TESTIMONY FROM HER AND I TOOK IT TO THEM IS ALL AND HERE IS HOW IT CONTINUED. 12:10 THIS MILITANCY WILL CONTINUE UNTIL ALL OF THE JEWS LEAVE THE LAND OF PALESTINE. 12:14 IT'S NOT A 2-STATE SOLUTION. 12:16 NO, THE MAJORITY OF THE PALESTINIANS ACCEPT THE 2-STATE SOLUTION. 12:21 LET ME PRESENT YOU WITH A HYPOTHESIS. 12:29 FENCES IT IN AND CLAIMS IT TO BE THE NATION OF THIS COMPOUND. 12:34 TO PROVE THEIR POINT, THEY STOP PAYING TAXES. 12:38 THEY SET UP THEIR OWN BANKS. THEY SET UP THEIR OWN SYSTEMS. 12:43 OR NEARBY THAT COMPOUND COME BY THEY SHOOT THEM. 12:47 THEY BEGIN TO GO INTO THE NEIGHBORING CITIES AND THEY BOMB PEOPLE. 12:56 AND INTO THE RESTAURANTS AND STRAP BOMBS TO THEMSELVES. 13:01 UNTIL YOU RECOGNIZE OUR COMPOUND AS A SEPARATE, SOVEREIGN NATION. 13:07 WHAT WOULD WE DO AS AMERICANS? WHAT WOULD OUR COUNTRY DO? 13:11 THAT IS WHAT WE ARE ASKING ISRAEL TO DO. 13:15 WE ARE ASKING TERRORISTS TO SET UP YOUR OWN COUNTRY. 13:25 AND WE ASK THEM TO THINK THAT THESE ARE ACTS OF WAR, NOT TERRORISM. 13:30 THEN, WE ARE ASKING ISRAEL TO RECOGNIZE THEM AS A STATE, TO BENEFIT TERRORISM. 13:37 WHY WOULD WE NOT DO THAT IN AMERICA? 13:39 OBVIOUSLY TWO REASONS COME TO MIND. 13:41 ONE, THAT'S NOT THE WAY A SOVEREIGN NATION OPERATES. 13:44 SECONDLY, IT REWARDS TERRORISM. 13:48 WOULD WE ALWAYS SUSPECT THAT THEY MAY DO MORE TO GET MORE LAND?OF COURSE. 13:57 FOR JEWS TO UNITE TOGETHER AND BAND TOGETHER. WE CANNOT REWARD TERRORISM. 14:13 A HUNDRED PLACES IN THE WORLD ARE OCCUPIED. 14:16 THEY DON'T ACTUALLY KILL THE OCCUPANTS. 14:18 THERE IS NO OTHER OCCUPIER. 14:21 HOW ABOUT IF YOU LIVED IN AMERICA. 14:23 WE HAVE NATIVE AMERICANS ON RESERVATIONS. 14:25 THEIR NATIVES TO THE LAND, YET THEY'RE OCCUPIED TOTALLY. 14:30 THEY DON'T COME OUT AND KILL PEOPLE. 14:34 THAT SITUATION WAS RESOLVED IN A WAY WHICH WAS ENTIRELY UNFAIR TO THE INDIGENOUS AMERICANS. 14:39 IT'S NOT IN RECENT HISTORY AND IT HASN'T BEEN VIEWED AS AN OCCUPATION OR A STRUGGLE FOR INDEPENDENCE. 14:48 THE INDIAN NATIONS ARE SEEKING THE RECOGNITION OF THEIR OWN IDENTITY AND NATIONHOOD WITHIN THE LARGER AMERICA. 14:57 NO, HERE WE ARE SEEKING OUR FREEDOM BECAUSE WE ARE UNDER MILITARY OCCUPATION. 15:02 ONE OF THE TERMS THAT DEFINES THE DEBATE FOR PALESTINIAN ARABS IS THIS WORD - OCCUPATION. 15:09 WE HEAR IT OVER AND OVER AGAIN. WE'VE HEARD HANAN ASHRAWI USE IT AGAIN. 15:17 AND IT'S THE COUNTRY OF LEBANON WHICH IS OCCUPIED BY SYRIA. 15:32 IN THE WEST BANK AND GAZA AND SO FORTH. 15:34 ALL OF THAT LAND WAS GIVEN TO THE JEWS UNDER THE ORIGINAL U.N. MANDATE. 15:40 THERE IS ANOTHER PALESTINIAN COUNTRY TODAY KNOWN AS JORDAN. 15:45 IT'S ALWAYS BEEN PREDOMINATELY PALESTINIAN POPULATION. 15:48 THAT REALLY OCCUPIES MOST OF THE TERRITORY THAT WAS GRANTED TO THE ARABS UNDER THE ORIGINAL U.N. MANDATE. 15:59 THIS WHOLE SILLY NOTION OF OCCUPATION HAS TO BE TURNED AROUND AND STOOD ON ITS HEAD. 16:05 ISRAEL IS NOT THE OCCUPIER. 16:08 IN ALL FAIRNESS, I INTERVIEW PEOPLE OF ALL SIDES IN QUESTIONS. 16:19 I THINK HE WOULD PROBABLY SAY, LOOK, WE WERE HERE A LONG TIME AGO. 16:24 PALESTINIANS ARE VARIOUS ARABS FROM VARIOUS STATES. WE MEAN THEM NO HARM. 16:36 AND WE DON'T KNOW WHICH WAY TO TURN. 16:38 THAT'S NOT THE RIGHT VIEW OF HISTORY. 16:41 ASK THE ISRAELIS YOU TALK TO, WHEN DID THEY COME TO PALESTINE. WHEN? 16:46 THOSE WHO WERE ORIGINALLY PALESTINIANS ARE A MINORITY WITHIN ISRAEL. 17:05 IN WHICH THERE WERE PEOPLE WHO'VE BEEN LIVING CONTINUOUSLY FOR CENTURIES. 17:10 WE'VE BEEN HERE FOR CENTURIES. 17:12 WE DIDN'T EMERGE ONLY IN RESPONSE TO THE CREATION OF THE STATE OF ISRAEL. 17:22 DIDN'T JUST COME ABOUT IN RESPONSE TO THE CREATION TO THE STATE OF ISRAEL - ONLY IN RESPONSE. 17:28 I THINK THERE'S SOME CANDOR THERE THAT I'D LIKE TO SEE FROM MORE OF THE PALESTINIAN SPOKESMEN. 17:40 INTO THE REGION SINCE THE CREATION OF THE STATE OF ISRAEL. 17:51 WHEN THE HIGHER LEVELS OF JEWISH IMMIGRATION BEGAN. 17:56 THAT IS A REALITY. THAT'S A REALITY THAT NEEDS TO BE DEALT WITH. 18:01 ONCE AGAIN WE SEE THAT THE FOLKS THAT WE REFER TO AS PALESTINIANS ARE ACTUALLY COMING FROM 22 ARAB STATES. 18:10 THEY'RE COMING FROM NON-ARAB STATES THROUGHOUT THE WORLD. 18:14 THEY'RE MUSLIMS FROM PAKISTAN. THEY'RE MUSLIMS FROM INDONESIA. 18:18 THEY'RE MUSLIMS FROM ALL OVER THE WORLD. 18:20 TODAY WE CALL THEM PALESTINIANS AND WE'RE DISCUSSING GIVING THEM RIGHTS TO A NATIONAL HOMELAND. 18:27 IT JUST DOESN'T MAKE ANY SENSE. 18:30 NOW ISRAELI POLITICS IS CHANGING, TOO, AS WE SPEAK. 18:39 BUT HALF OF THE ISRAELI GOVERNMENT WALKED OUT. >>NOT HALF, BUT A MAJOR PORTION. 18:47 BUT IN THE ISRAELI KNESSET THERE'S A SEA CHANGE. 18:51 A WHOLE LABOR PARTY WALKED OUT OF THE GOVERNMENT. 18:53 IT'S A MINORITY OF THE GOVERNMENT, BUT STILL THEY LEFT. 18:56 THIS LEAVES A POSSIBILITY OF NEW ELECTIONS COMING UP. 19:01 IT'S QUITE A SHAKE UP. IT BRINGS PERSONALITIES OUT OF THE CLOSET, SO TO SPEAK. 19:06 JUST TO ASK, OF COURSE YOU HAVE SHARON IS IN POWER AND HE WANTS TO REMAIN IN POWER. 19:11 YOU HAVE NETANYAHU BEING SUGGESTED. 19:14 DO YOU HAVE ANY PREFERENCE AMONG THESE GENTLEMEN? 19:15 IT IS THE LESSER OF 2 EVILS, HUH? 19:20 I THINK THEY ALL BELONG TO ONE CAMP. 19:22 THEY MAY HAVE INTERNAL, DOMESTIC DIFFERENCES MOTIVATED BY THEIR OWN AMBITION. 19:27 WHO WANTS TO OUTFLANK WHOM FROM THE RIGHT? 19:43 BENT ON GETTING ITS INDEPENDENCE AND FREEDOM AND DIGNITY ON ITS OWN LAND. 19:48 THEY BOTH ADOPT MILITARY MEANS AND VIOLENCE FOR MEANS OF SUBDUING A NATION. 19:54 TO ME, THERE IS DANGER TO ISRAEL AND TO PALESTINE IN HAVING SUCH AN EXTREMIST GOVERNMENT. 20:00 YOU ALSO FORGOT ONE INGREDIENT. 20:22 AND KICK OUT ALL THE PALESTINIANS AND BOMB EGYPT AND BOMB IRAN. 20:29 YOU HAVE A VERY DANGEROUS COMBINATION OF EXTREMISM. 20:33 NOT THAT THE LABOR PARTY MADE A LOT OF DIFFERENCE IN THAT CABINET. 20:38 WAIT A MINUTE. BARAK WAS A PRIME MINISTER OF THE LABOR PARTY. 20:51 ARAFAT DIDN'T SAY, THIS IS WHAT WE WANT. WE'LL TAKE IT. 20:54 I'M GLAD YOU RAISED THIS QUESTION BECAUSE THERE HAVE BEEN SO MANY MYTHS AND DISTORTIONS. 20:59 AMERICAN VIEWERS HAVE ACCEPTED A CERTAIN VERSION THAT HAS NOTHING TO DO WITH REALITY. 21:05 IN CAMP DAVID THERE WAS NO, AS YOU SAY, GENEROUS OFFER. 21:10 THERE WERE DISCUSSIONS. THERE WERE INITIAL IDEAS. 21:13 THERE WAS NOTHING IN WRITING. THERE WERE NO AGREEMENTS. 21:24 WHICH IS THE WEST BANK AND GAZA, TO MAINTAIN MORE SETTLEMENTS. 21:31 TERRITORIALLY NON-CONTINUANT AND, THEREFORE, NOT VIABLE. 21:35 HE WANTED TO ANNEX AREAS WITHIN JERUSALEM, AROUND JERUSALEM. HE FRAGMENTED THE WEST BANK. 21:41 HE WANTED US TO RELINQUISH THE RIGHT OF RETURN FOR ALL REFUGEES JUST LIKE THAT. 21:46 THEN TO SAY THIS IS THE END OF THE CONFLICT, WE SAID, OK.
21:49 THESE ARE NOT ISSUES ON WHICH WE CAN COME TO AN AGREEMENT. 21:54 THESE ARE IDEAS THAT NEED FURTHER DEVELOPMENT. 21:57 THEY WILL NOT FORM A SOLUTION BECAUSE THE ESSENTIAL INGREDIENT OF JUSTICE IS MISSING. 22:03 LET'S EXPLORE THEM FURTHER. THERE WAS NO REJECTION AND THERE WAS NO OFFER. 22:13 NUMBER ONE, IT MUST BE STATED THERE WAS AN OFFER MADE. 22:17 IT MUST BE STATED THAT ARAFAT DID, IN FACT, WALK AWAY. 22:21 HE WOULD NOT SIGN AN ACCORD AND HE WOULD NOT SIGN AN AGREEMENT. 22:24 HE HAS A VESTED INTEREST IN REVOLUTION, BUT PERHAPS NOT AS MUCH IN PEACE. 22:40 THERE WAS NO REJECTION OF A PEACE PLAN. 22:48 THAT THERE WAS NOTHING REALLY CONCRETE PUT ON THE TABLE. 22:51 SO THERE WAS NOTHING TO REJECT IN THE FIRST PLACE. 22:53 AS I UNDERSTAND IT, SHE WAS NOT A PART OF THOSE NEGOTIATIONS. 22:57 SHE WAS NOT A PART OF THE PALESTINIAN AUTHORITIES NEGOTIATING TEAM. 23:06 THAT ARE AVAILABLE TO ALL OF US PEOPLE WHO READ NEWSPAPERS AND SO FORTH. 23:21 UNBELIEVABLE CONCESSIONS THAT WERE MADE BY ISRAELIS, BY THE ISRAELI LEADERSHIP. 23:33 INCLUDING JERUSALEM, WAS PUT ON THE TABLE. 23:36 THE TEMPLE MOUNT WAS PUT ON THE TABLE. 23:40 THAT IS INDEED WHY BARAK WAS ULTIMATELY REJECTED BECAUSE THIS PEACE PLAN FAILED. 23:51 THE PALESTINIANS, HAPPY IF THEY REJECTED THESE KINDS OF CONCESSIONS. 23:58 THAT'S THE LONG AND SHORT OF IT. 24:01 WE GAVE DR. ASHRAWI AN OPEN MIC AS THEY CALL IT IN THE BUSINESS. 24:05 SHE WAS ALLOWED TO TALK AT LENGTH AS SHE PLEASED. 24:08 WE DIDN'T TIME IT OR SAY IT WAS A 15 MINUTE INTERVIEW. 24:11 WE JUST LET HER GO AHEAD AND TELL US WHAT SHE WANTED TO TELL US. 24:20 ARAB-CHRISTIANS IN AMERICA AND THEY COMMENTED ON WHAT SHE SAID. 24:23 YOU BE THE JUDGE. I'M IN THE MIDDLE. 24:27 I GOT THE INTERVIEW, TRANSFERRED THE TAPE AND THAT'S ALL. 24:31 THERE WILL COME A TIME IN THE FUTURE WHEN WE WON'T HAVE TO WORRY ABOUT THESE THINGS. 24:40 THE KINGDOM TO COME WILL BE IN THE HOLY LAND. 24:43 IT WILL BE IN JERUSALEM AND ALSO IN RAMALLAH. 25:09 TO EGYPT AND BACK, THEREFORE DESCRIBING PEACE. 25:13 WE CROSSED A BORDER, SO VERY TREACHEROUS AND DANGEROUS JUST TO MAKE THIS PROGRAM. 25:18 IN THAT DAY, WE COULD GO ACROSS NATIONAL BORDERS, NEVER MIND THE BORDER BETWEEN JERUSALEM AND RAMALLAH. 25:39 LET ME TEACH YOU SOMETHING. 25:41 IN HEBREW, THE WORD SALVATION IS YESHUA. IT'S JESUS' NAME. 25:47 IT'S WHAT HE WAS CALLED IN ISRAEL - YESHUA. 26:07 BECAUSE HE WILL BRING HIS PEOPLE SALVATION. NOW IT MAKES SENSE. 26:15 THE VERSE TEACHES THAT JEHOVAH BECOMES JESUS AND COMES TO THE EARTH AND BRINGS YESHUA - SALVATION TO US. 26:25 UNTIL THAT DAY COMES, HOWEVER, RAMALLAH AND JERUSALEM ARE AWFULLY CLOSE TOGETHER. 26:31 AS YOU CAN TELL FROM THE TESTIMONY, THEY'RE STILL QUITE A BIT OF ARGUMENT GOING ON. 26:52 A BOMBED OUT CAR AND ALL THE REST OF IT. 26:57 I WAS STRUCK BY THE FACT THAT THEY'RE SO CLOSE TOGETHER. 27:00 WHEN YOU THINK OF THESE EVENTS IN RAMALLAH, IT IS RIGHT ON THE BORDER OF JERUSALEM. 27:06 AS YOU DO THAT, SHA'ALU SHALOM YERUSHALAYIM, PRAY FOR THE PEACE OF JERUSALEM.